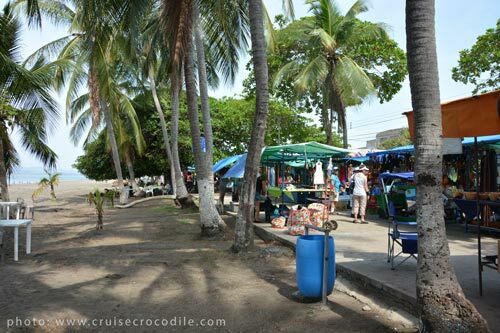 Our Punterenas cruise port guide gives you information about the docking location, cruise dock, transportation options and much more! 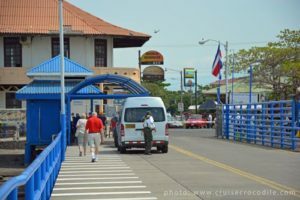 Welcome to the Puntarenas cruise port guide. Some cruise ships will call this port of call Puerto Caldera instead of Puntarenas. 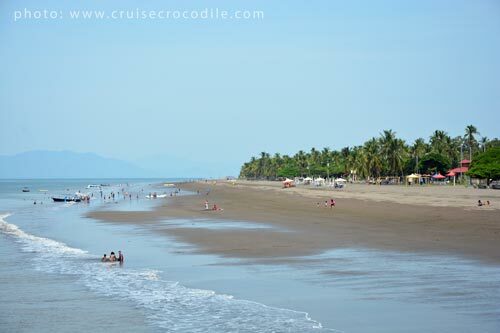 Fact is Puerto Caldera and Puntarenas are two different ports of call from where you can explore beautiful Costa Rica. You will have the opportunity to explore the volcanoes, mountains, rainforests, coffee plantations, wildlife and waterfalls of this beautiful country. While Costa Rica might be one of the smallest countries of Central America it is also one of the most naturally diverse! Check out your option of how to get out and about at the cruise port of Puntarenas. This is the long cruise dock where your ship will dock. This is the security point at the exit of the cruise dock. From here you walk straight into the centre of town. 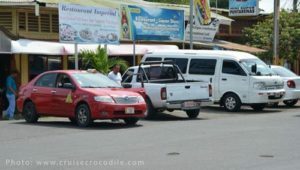 The white vans are tourist excursion vehicles and the red cars are official taxis. 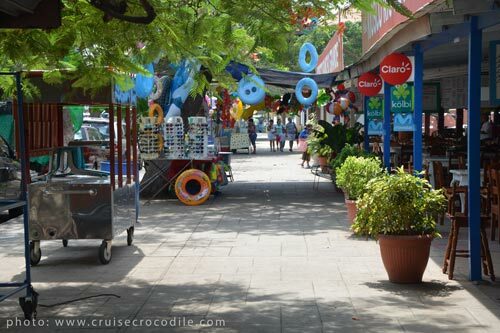 When you exit the cruise dock you will see a black sand beach on the right and left hand side. Cruise ships dock at the long pier of Puntarenas. Shore excursion buses from the ship are waiting for you on the pier. The independent travellers can walk to the end of the pier where you will go through security. 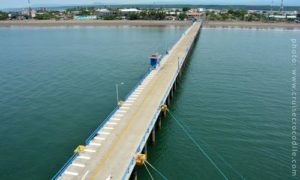 When you exit the pier you will be right in the centre of Puntarenas. When you exit the cruise port you will see a rather nice crafts market that runs parallel to the beach directly to your left hand side. This is a great place to pick up your local souvenirs like coffee, flutes and work from the local artists. Directly at the exit of the port at your left hand side you will see a line of restaurants. They all provide w-fi when you purchase a drink or lunch. At the exit of the port there are also lots of mini vans that say “Turismo”. These vans are waiting to gather a small group of people to visit sites of interest. The tour vans have no fixed route. 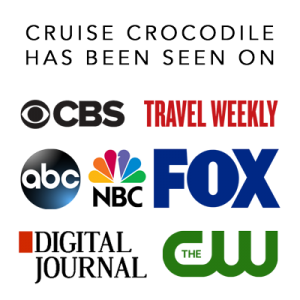 The drivers carry around a list of places of interest and you simply put together an itinerary and hopefully more people will want to join your group. Make sure to negotiate a price before you step in. The price is usually negotiated per person. There are no fixed prices so make sure you bring your bargaining skills. At the exit of the pier you will be overloaded by taxi and tour operators. You will recognise official taxis by their red color and yellow triangle. 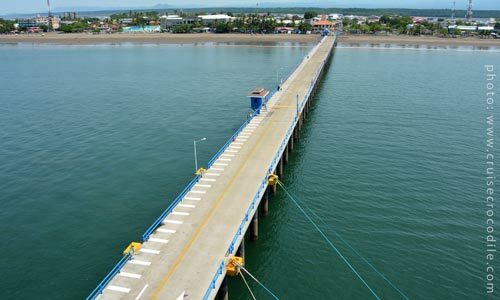 The Puntarenas cruise dock is located on the peninsula of Puntarenas. Cruise ships dock on the long pier and from here passengers can walk straight onto the beach and to the local market and restaurants. There are also plenty of taxis waiting for your at the exit of the cruise port. 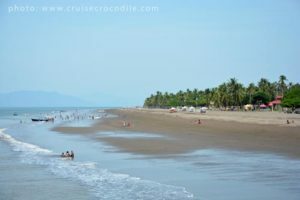 Read about all your options in the full Puntarenas cruise port guide.